What a Michelle Pfeiffer photo shoot can teach advisors about their clients. Michelle Pfeiffer was and is a major movie star. People magazine put her on the cover for its first “50 Most Beautiful People” issue in 1990. The New York Times, no less, called her “devastatingly gorgeous.” So when Esquire magazine’s December 1990 cover asked “What Michelle Pfeiffer Needs …,” the answer printed on the inside front cover—“Is Absolutely Nothing”—seemed superfluous at best. However, as it turned out, she needed a lot of help to look like she did on that cover, which was perfect. As Danielle Nicole DeVoss and Julie Platt of Michigan State reported, an Esquire editorial memo to a photography retouching company included detail about what needed to be done to make Ms. Pfeiffer seem perfect: “clean up complexion, soften eye lines, soften smile line, add colour to lips, trim chin … soften line under ear lobe … add hair to top of head.” Gorgeous wasn’t enough. Esquire—like many of our clients—wants perfect. By any measure, 2013 was a great year for stocks. Yet anybody who tried to diversify or hedge meaningfully got hurt, at least in comparison to those who were all-in on domestic equities. The Global Dow Jones Index was up over 27% for the year but the Global Dow ex-U.S. was up “only” about 9%. Long-term Treasuries were down 15% for the year and corporate bonds were down 7% despite a generally constructive credit story. Municipals, agencies and mortgage-backed securities all finished in the red; REITs were flat. Gold got crushed and other commodities performed poorly too. Meanwhile, there were more stocks in the S&P 500 that returned 60% or more for the year than stocks that lost money. The key to “beating the market” in 2013 was thus simple if incredibly dangerous: no bonds, no shorts, no hedges, no diversification and no tactics. But because of my commitment to diversification, I would never advocate that sort of approach. Thus it’s a given that any portfolio I constructed would underperform U.S. stocks in 2013. A terrific and diversified portfolio with excellent overall performance wouldn’t necessarily look all that great to clients. It wouldn’t have been perfect or even a reasonable facsimile thereof. That’s why managing client expectations is so important. Clients tend to assume that we should be able to forecast markets like 2013 in advance. Oh that it were so. Since 1990, the Federal Reserve Bank of Philadelphia has conducted a quarterly Survey of Professional Forecasters, continuing research conducted from 1968-1989 by the American Statistical Association and the National Bureau of Economic Research. The survey asks various economic experts their views of the probabilities of recession for each of the following four quarters. A CXO study of that data determined that the forecasted probability of recession for a quarter explained absolutely none of the stock market’s returns for that quarter. The data even suggest that the forecasts were a mildly (if not materially) contrarian indicator of future U.S. stock market behavior. The survey reads like a primer on recency bias in that bear markets lead to bearish market forecasts and vice versa with no predictive power whatsoever. A 2005 Dresdner Kleinwort study of market analysts showed the same thing, entirely consistent with a long line of academic research (most prominently from Philip Tetlock) establishing the lack of value provided by so-called “expert” forecasters across fields and disciplines. Quite obviously, the “experts” are like the rest of us—they tend to worship at the altar of price momentum in the church of what’s happening now. Markets, like analysts and investors, tend to assume that tomorrow will look a lot like yesterday, moving as a herd toward what is often the wrong conclusion. More recent events continue to support this idea. According to Bloomberg, the 50 stocks with the lowest Wall Street analyst ratings at the end of 2011 outperformed the S&P 500 by seven percentage points in 2012. Expert forecasts were even worse in 2013. Morgan Housel recently dug through FactSet data on companies with the most buy and sell recommendations from Wall Street firms as of January 2013. He discovered that the companies with the most sell ratings that month outperformed the market by a median 25 percentage points, while those with the most buy ratings underperformed by more than seven percentage points. Mainstream Wall Street analysts routinely forecast how the S&P 500 Index will perform. The index started 2013 at 1426.19, closed at 1848.36 and yielded a total return of 32.4%. 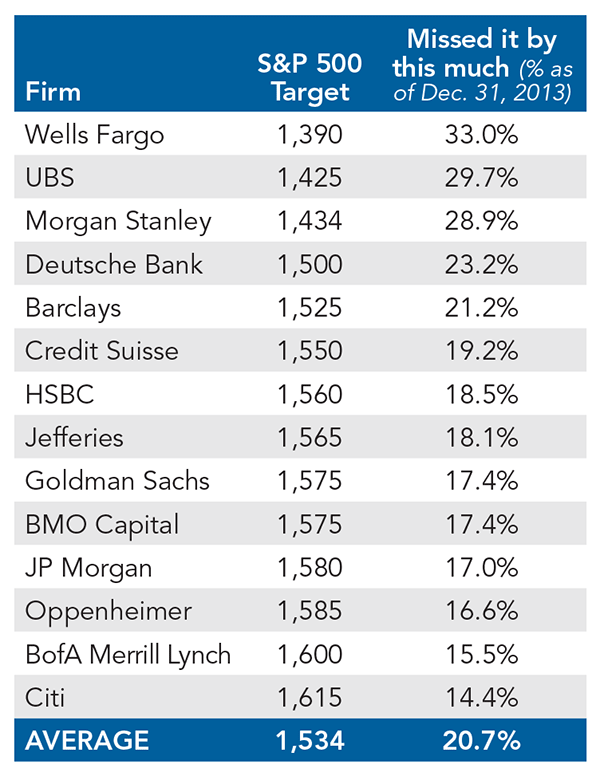 I have listed the Wall Street forecasts from a wide range of mainstream firms for 2013 below with the percentage by which they missed the mark on a price basis. Summary: They missed by a lot. Our forecasting skills are limited at best. That’s why diversification is so important. Every retail advisor has experienced the frustration of being able to report good performance overall but having the client fixate on those things that didn’t go so well. That frustration is difficult enough when the underperformance is real. But often the “problem” is nothing of the sort—it’s simply a down period for a particular diversifying investment type or sector. Diversification doesn’t mean owning a bunch of different things that are all doing well. However, for whatever reason, we humans tend to pick apart the pieces more than appreciate the whole. This problem relates to “fundamental attribution error”—the error we make when we overweight the role of the individual and underweight the roles of chance and context when trying to explain successes and failures. Advisors or managers who claim to strive to outperform during all markets (much less claim to actually succeed at that) should be treated with great skepticism, because there is no evidence suggesting they can do so over the longer-term. Of course, as GMO’s James Montier has pointed out, advisors and fund managers know that that’s the great white whale that many investors (and advisors!) are chasing, so they’ll keep offering it to them, even though they can’t deliver. That’s what made Bernie Madoff so beguiling: his apparent (and fraudulent) ability to deliver consistently high returns regardless of the market environment. A portfolio without assets that aren’t performing well on a nominal basis is not diversified. Yet that diversification is a very good thing indeed. Thus managing client expectations to expect as much is a crucial part of the job. Perfect simply isn’t possible. We should make that clear from the get-go. No diversified portfolio is full of winners all the time. Such an expectation isn’t just unrealistic—it’s nuts. By any reasonable measure, Michelle Pfeiffer is gorgeous without a bit of touch-up work. Perfectly wonderful portfolios aren’t perfect either. But they are a lot better than trying to be perfect.